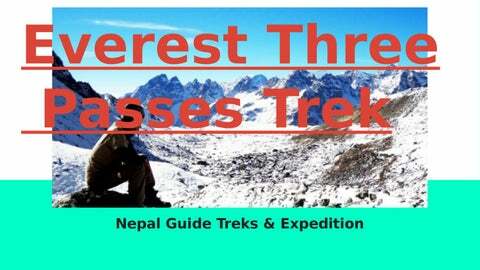 Everest THree Passes ● Everest Three Passes Trek with Nepal Guide Treks and Expedition is an Trekking unlimited adventure for keen trekkers seeking to explore the high altitude trekking trails that go through the midst of world's towering mountains and discover the hidden natural wonders within the - World Heritage site of UNESCO " Sagarmatha (Everest) National Park ". 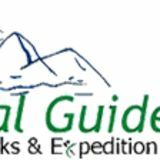 ● In fact, the trek offers lifetime experience of crossing three high passes trek in the Everest Region. Our three high passes trek includes the crossing of Renjo La Pass at 5435 meters, Cho La Pass at 5420 meters and Kongma La Pass at 5535 meters in one trek. ● Our three high passes trek includes the crossing of Renjo La Pass at 5435 meters, Cho La Pass at 5420 meters and Kongma La Pass at 5535 meters in one trek. Day 11: Trek from Dragnag to Dzongla [4843m/15885ft] via Chola pass [5420m/17777ft] [6-7 hrs walk] Day 12: Trek from Dzongla to Gorakshep [5180m/16990ft] and opt. trek to Everest Base Camp [5380m/17646ft] [7-8 hrs walk] Day 13: Morning climb to Kalapatthar [5545m/18187ft] and back to Gorakshep. Trek to Lobuche [4910m/16104ft] [5-6 hrs walk] Day 14: Trek from Lobuche to Chhukung [4730m/15514ft] via Kongma La Pass [5535m/18154ft] [7-8 hrs walk] Day 15: Trek from Chhukung to Dingboche [4410m/14464ft] [4-5 hrs walk] Day 16: Trek from Dingboche to Namche Bazaar. [6-7 hrs walk] Day 17: Trek from Namche Bazar to Lukla. [5-6 hrs walk] Day 18: Fly from Lukla to Kathmandu. Day 19: Free day in Kathmandu. Day 20: Transfer to International Airport for Departure.